President Michael D Higgins met with asylum seekers and refugees at a centre in Athens on the final day of his state visit to Greece. 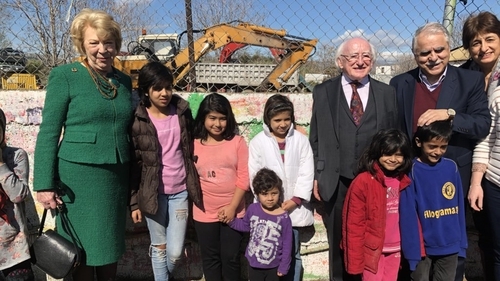 The President and Sabina Higgins visited Eleonas refugee camp, which is run by the Greek authorities with support from the UN Refugee Agency, the International Rescue Commitee and other NGO's. Eleonas hosts around 1,500 people, mainly Afghans, Syrians and Iranians, living in prefabricated units. They include single adults, families and unaccompanied children. During his visit President Higgins paid tribute to Greece’s efforts in dealing with the refugee crisis. "The Greek people, in the generosity of their response to the plight of refugees, in offering shelter and a dignified future to so many, have provided an example of hospitality and solidarity not only to the people of Ireland, but to the peoples of our European Union," he said in a speech on Thursday. "It is an example, I hope, that will be taken up with answerable efforts," he added. Meanwhile, a group of nine volunteers from Scouting Ireland, who have been working with young asylum seekers and refugees in Athens since last summer say the situation in the Greek capital remains critical. "There's still a big job to be done. There's a massive backlog in the system which means people can't move on to their destinations quickly. They can be stuck in camps in Greece for six months to two years," said one of the group, Eoin Mulville.